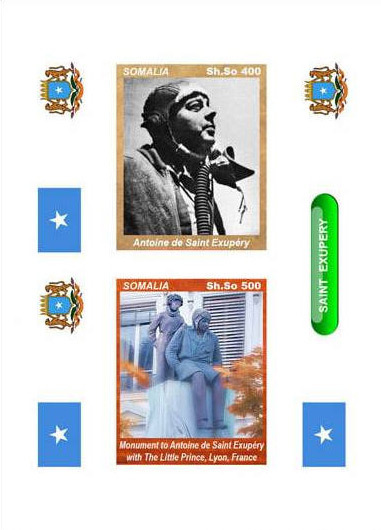 See the labels at "Equatorial Guinea", for similar Saint-Ex Cinderellas. 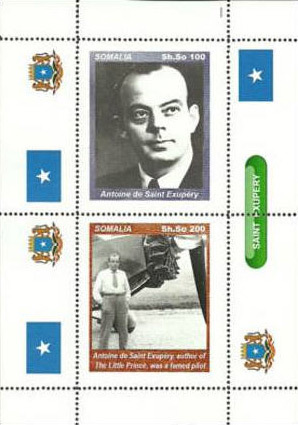 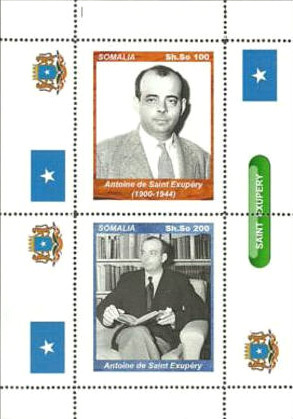 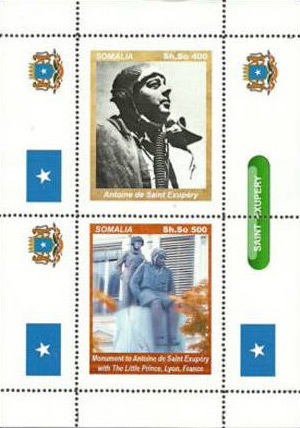 These labels appear at first glance to be postage stamps of Somalia, but closer examination shows that they are not real stamps, nor of that country. 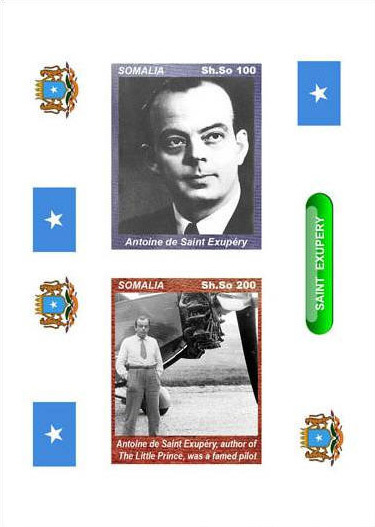 "Somalia ... officially the Somali Republic (Somali: Jamhuuriyadda Soomaaliya, Arabic: جمهورية الصومال‎ Jumhūriyyat aṣ-Ṣūmāl) and formerly known as the Somali Democratic Republic under Socialist rule, is a country located in the Horn of Africa. 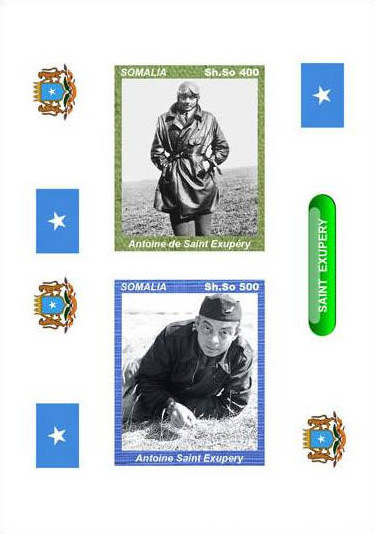 Since the outbreak of the Somali Civil War in 1991 there has been no central government control over most of the country's territory. 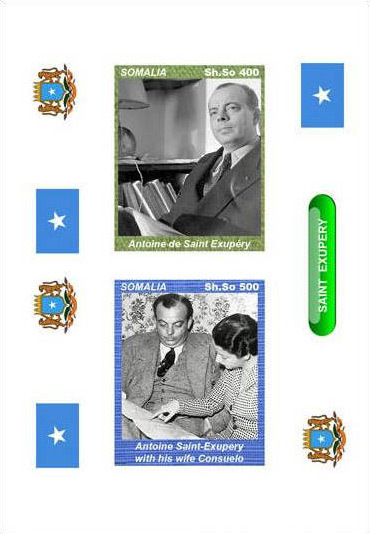 The internationally recognized Transitional Federal Government controls only a small part of the country. 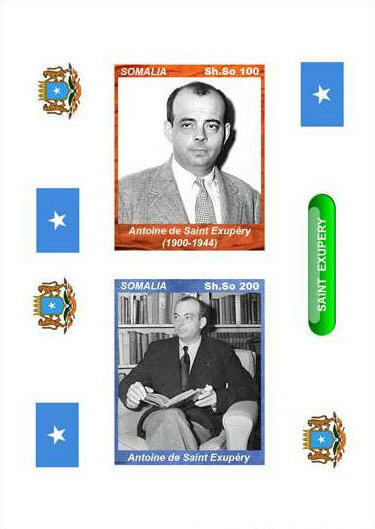 Somalia has been characterized as a failed state and is one of the poorest and most violent states in the world." 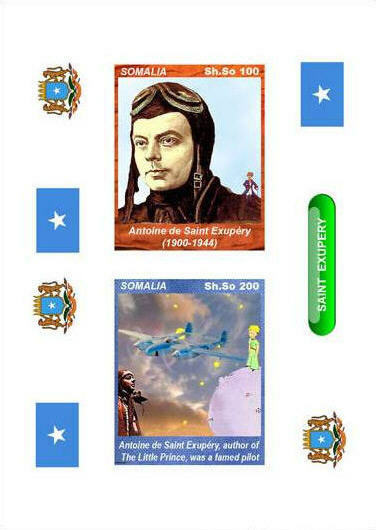 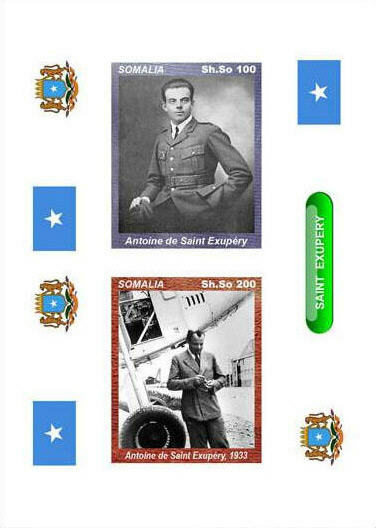 The labels use the flag and seal of the Somali Republic, as shown on the Wikipedia site. 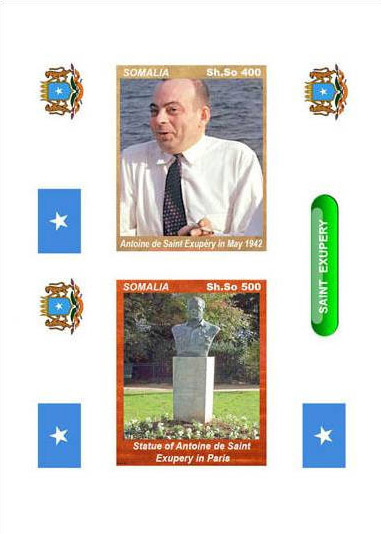 The denomination is indicated as Sh.So. 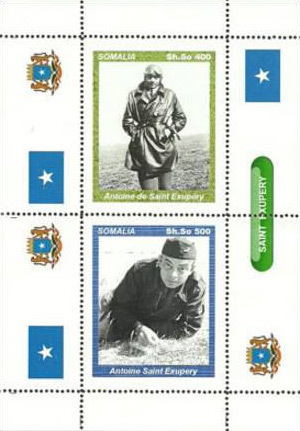 (Somali Shilling), similar to actual stamps of Somalia. 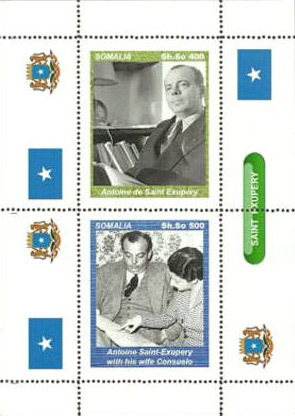 "Cinderella means a label similar to a stamp ... not used for postage and not connected with a location printed on the label,” Eurofila's disclaimer, in J.M. 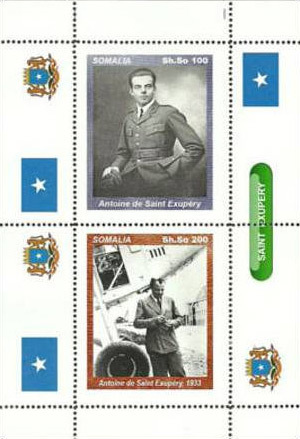 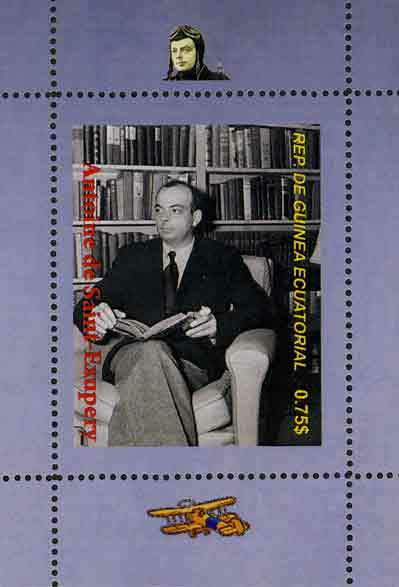 Chute's (Jun 2002) article, Illegal Stamps. 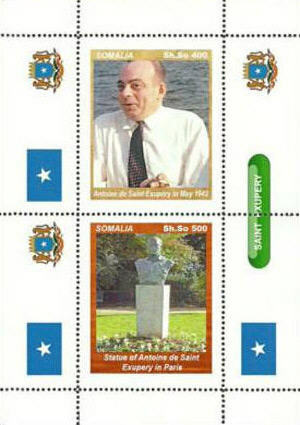 See also A different perspective on illegal stamps, Linn's, (Feb 2001) by Michael Laurence. 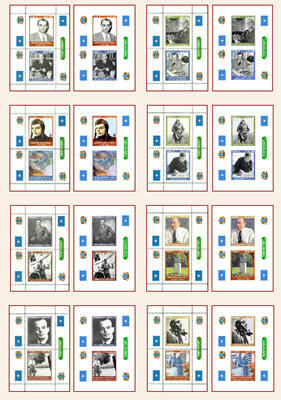 If you have additional information on these labels, please let me know.